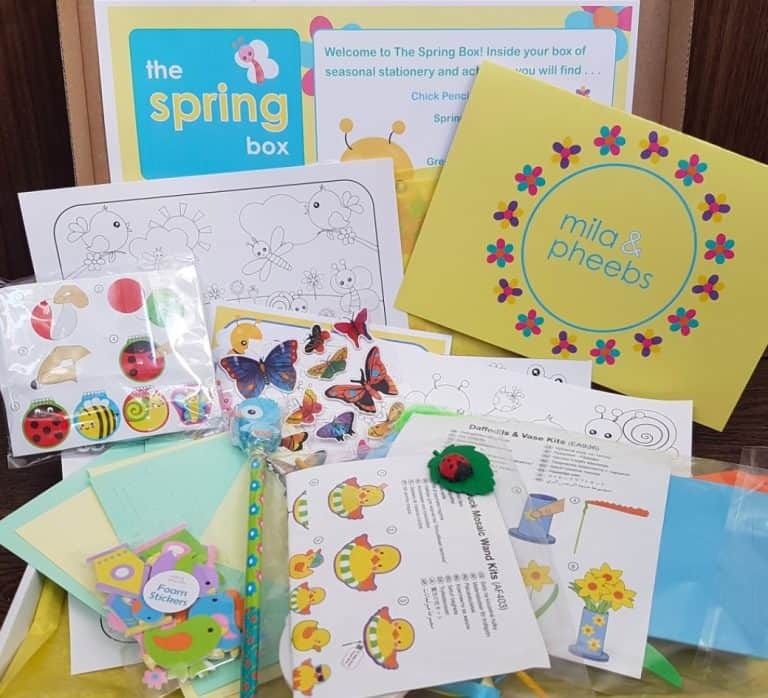 The lovely people at Mila and Pheebs have sent me another of their kids’ activity boxes. 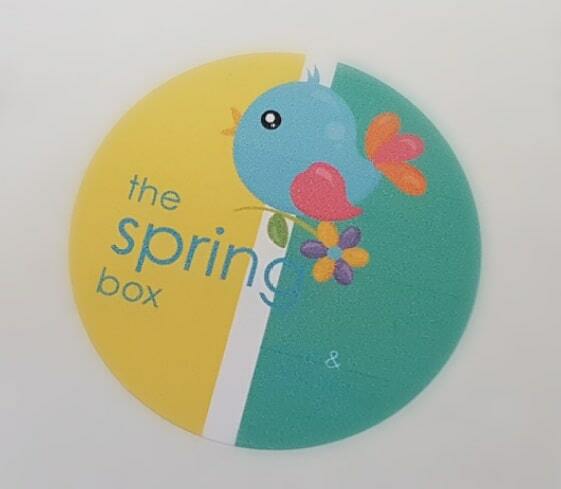 After the triumph of last month’s Fun at the Farm box, the theme for March is Spring. It is perfect timing, with some sunny weather (at last), daffodils scattered on the verges, and the blossom and wildlife bursting out all over the place. How poetic. 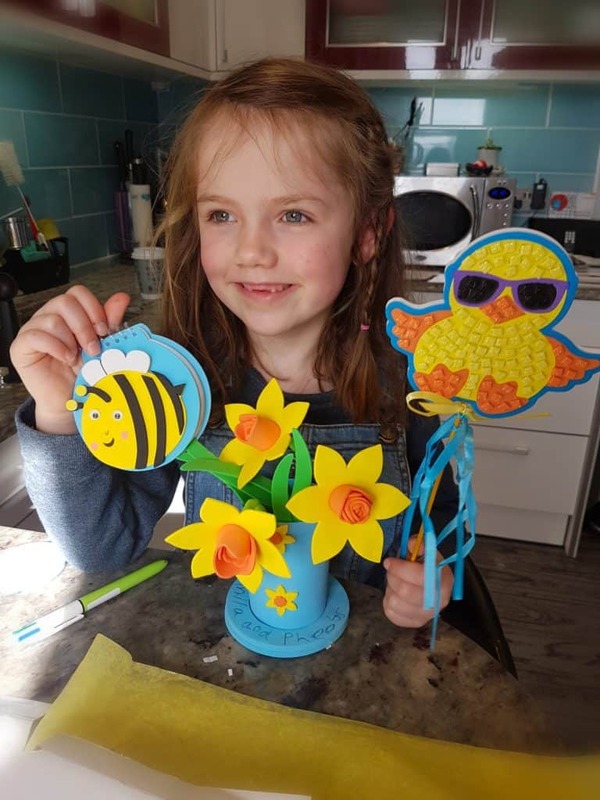 Anyway, as usual my lovely helper is my six-year-old daughter Little C, who is a great fan of all things crafty and creative. This time I took the precaution of opening and photographing the box while she was eating lunch, because as you can imagine, it’s rather difficult to prevent eager little hands scattering things far and wide before they have been nicely arranged for their close-up. But once she had eaten (apologies in advance for any traces of egg round her mouth in the pictures, I failed to wipe her face because I forgot) she got to dive in and play. The box is nice and thin, and fits through the mailbox just fine. This always impresses me, especially because they manage to fit rather a lot in there. 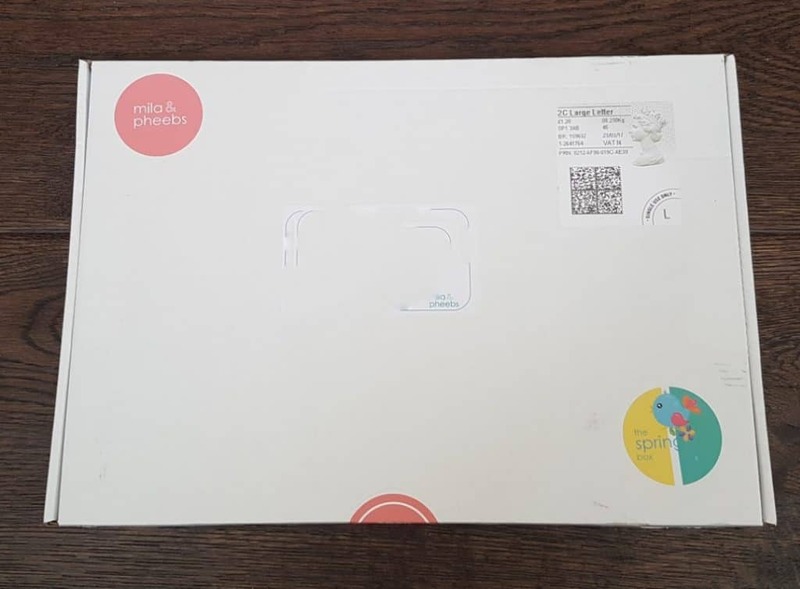 It’s a plain box but with nicely branded stickers, plus the theme. I think a box really has to be branded on the outside; it doesn’t have to be fancy but it’s important to have that little bit of anticipation! There is always a menu on the inside of the box lid. I never look at it because I like to be surprised, but it’s cheerful and informative. On top was what I thought was just a regular flyer, but actually it’s something new: a newsletter! This is the first time they’ve included one of these, and I think it’s a lovely idea. It’s not pages and pages of stuff, but it’s a nice introduction; there’s a joke, a fun fact, and I think the diary dates are a very useful inclusion, not least because I still didn’t know when Easter actually was. Anyway, this is an excellent touch, the paper is nice quality, the colours are bright, and the text is beautifully clear and easy for little people to read. Under the tissue are some enticingly bright shapes and the promise of things to make. And of course, stickers. I grabbed this little guy from underneath the top layer. It’s another of their super-cute collection of erasers. 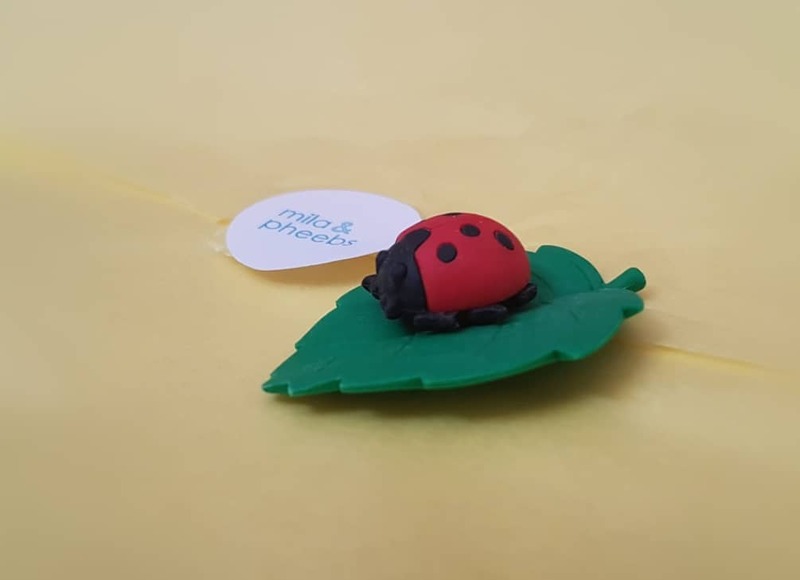 Last month’s was the most adorable cow, and this gorgeous little ladybug will be joining her on our shelf. This eraser will not be used, it’s far too adorable. I also discovered that these are called Iwako erasers, which are a Japanese brand. So I can use the word kawaii! (Those of you who are dedicated readers of my reviews will know I have reviewed several Japanese kawaii boxes.) Mila & Pheebs sell a whole range of these erasers on their website. 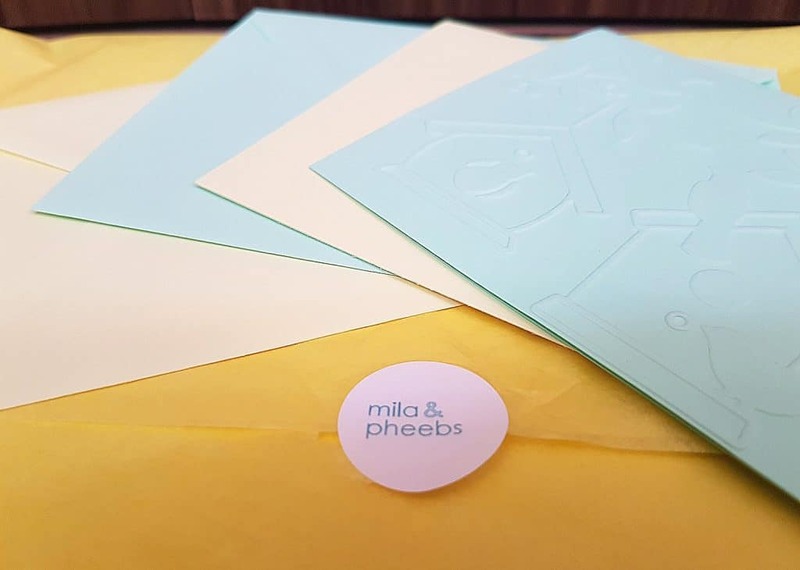 Mila and Pheebs boxes always contain a couple of blank greetings cards. These are in lovely pastel spring colours; one is plain and one has a lovely relief design of birds and birdhouses. 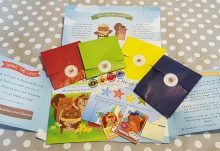 Perfect for your child to decorate and give to a significant person in their life. Or in my daughter’s case, she thought her favourite stuffed rabbit might enjoy one of the cards. I guess I know where her priorities lie then. Now we come to the kits. 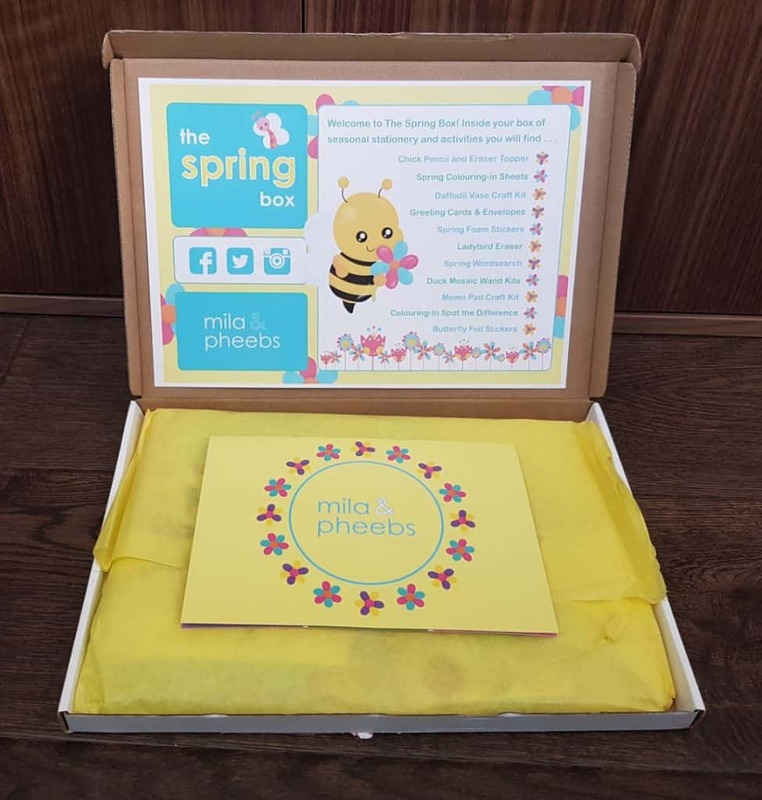 The Mila & Pheebs boxes always contain at least a couple of these, and they are a lot of fun. They’re not super-elaborate or fancy, and they don’t take a long time, but the results are very pleasing. 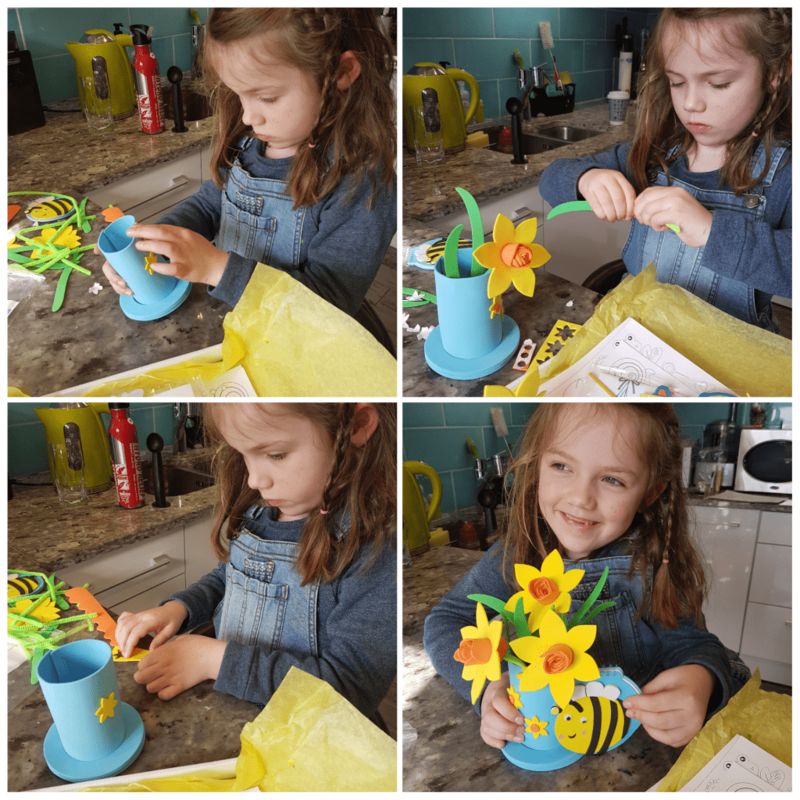 You have little sets to decorate a bug notepad, a duck mosaic wand kit, and make a vase of daffodils. Spring-tastic! Bring on the stickers! Some lovely foam stickers of birds and birdhouses, perfect for a spring avian collage. And butterflies, because it’s so lovely to see them fluttering around. And another of their lovely pencils with the cute eraser topper, this time a gorgeous blue chicky. Finally, some colouring sheets. 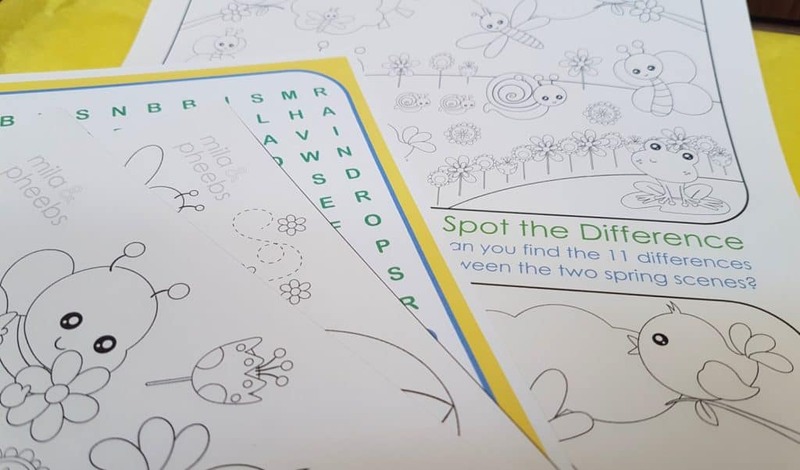 As well as a couple of cute garden and bug scenes, there is a Spot the Difference and a wordsearch. Anyway, on to the action photos. 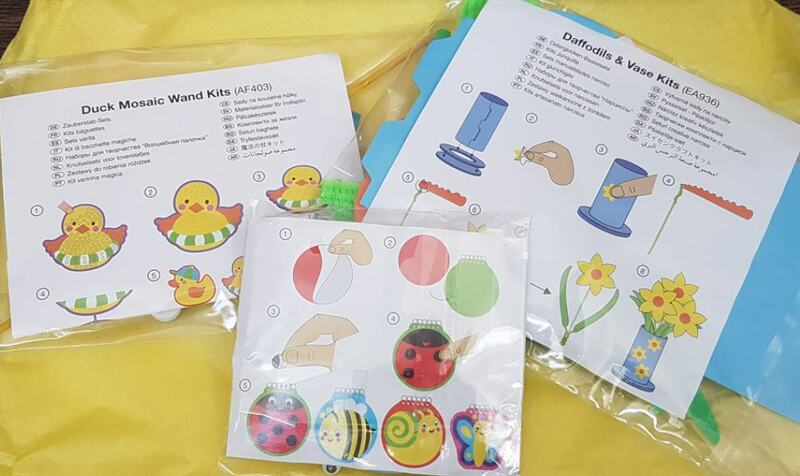 The kits were the first things my daughter went for (except for the ladybug eraser, which I confiscated immediately) and we had lot of fun putting them together. The first thing was a little notebook with foam stickers to decorate it. This one was (obviously) a bumblebee. 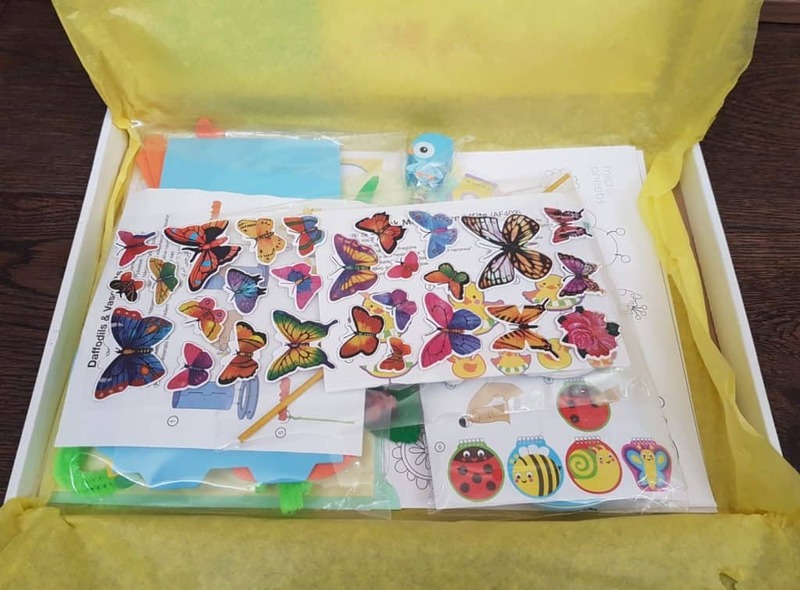 It didn’t take very long to put together, but the end result was lovely, and notebooks are always useful, especially for a child who is constantly writing and drawing. Our house is littered with drawing books and sheets of paper covered in stories and pictures, so one more won’t hurt. Next was the little vase. 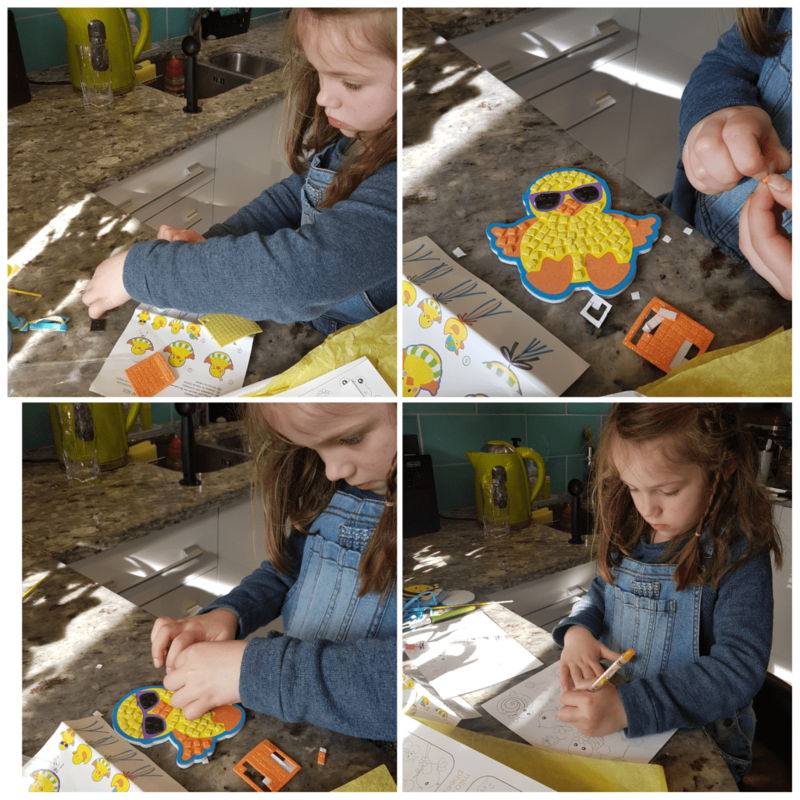 There were various foam shapes, both sticky and non-sticky, plus pipe cleaners (some of the best craft items ever), and the picture instructions are very clear. Some sticking rolling, twisting, and arranging later, we had a lovely display. The bee notepad was pretty interested in the new flowers. 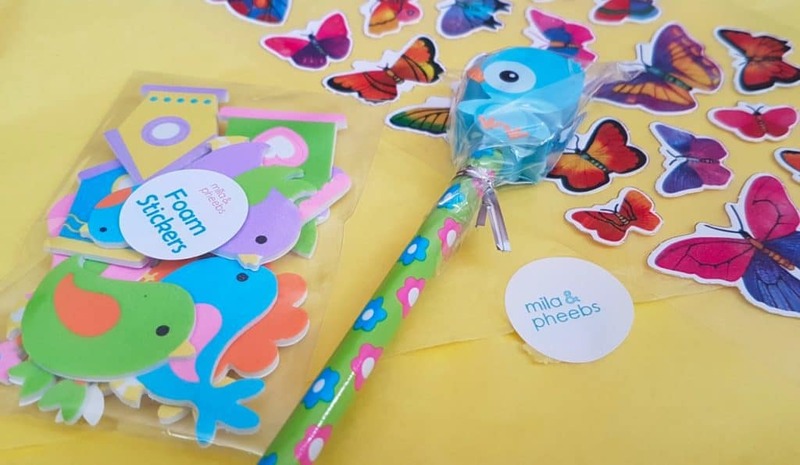 Once again, Mila and Pheebs have produced a splendid selection of fun and creative items with a charming theme. 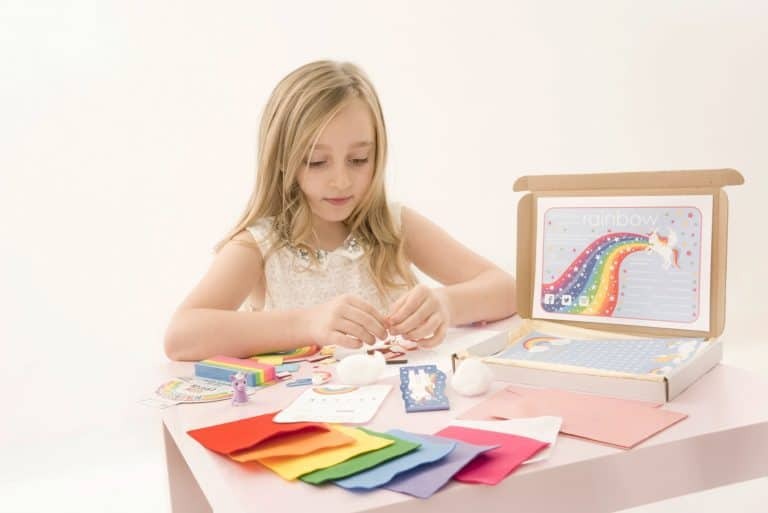 There is a great combination of organized things to do, such as the little craft kits, and general stationary items. The kits are just the right balance of an attractive result and a fairly fast completion time, so little danger of attention spans wandering. They’re also simple enough that young children can do the bulk of the work, but not too much parental assistance is required. 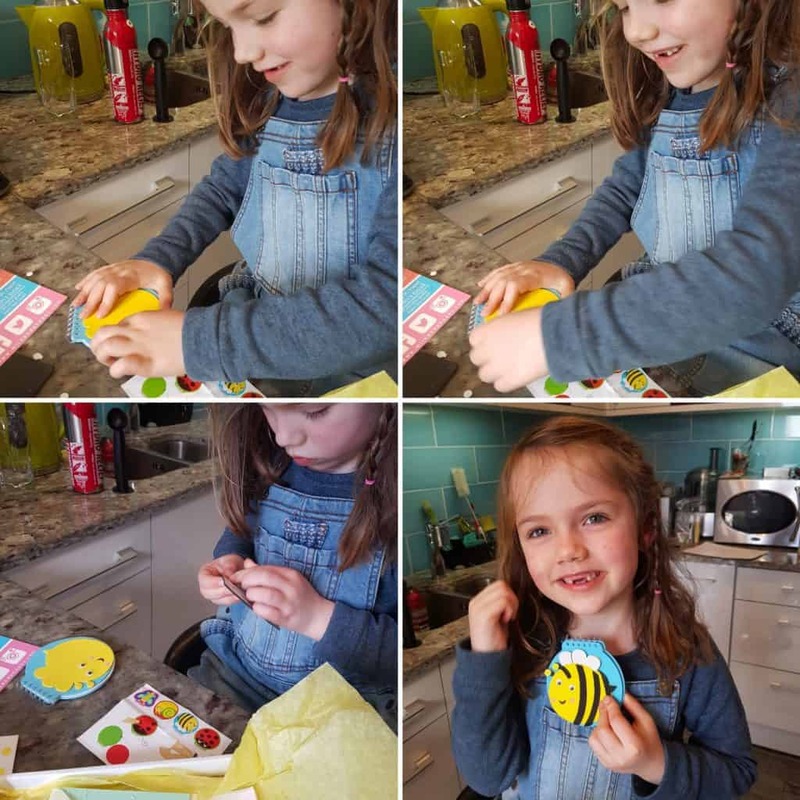 Stickers are always incredibly popular with children, and the inclusion of two blank greetings cards is an inspired touch. A wordsearch is a nice nod to something faintly educational, and you can never have too many things to colour in. There is plenty of opportunity for free creativity as well. The price, £13 including shipping, is pretty good. It’s not super-cheapie, but as the box includes things you both use and keep, it’s a great way of increasing your craft stash without taking up a lot of space as well as great entertainment value. The selection of items are very well-thought-out, and great deal of care has been taken to include a good variety. I love that the theme is neutral, not particularly aimed at boys or girls,which means you could give this to any young child. My daughter is six, and loved it, and I can see her enjoying this type of thing for at least the next couple of years. 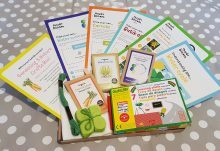 As well as being a lovely monthly treat, their one-off boxes would make a terrific gift. 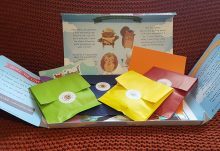 They also do a sibling box, with extra items so no one gets left out of the creative fun! Oh, and I love the newsletter, it’s a really good addition to this box. 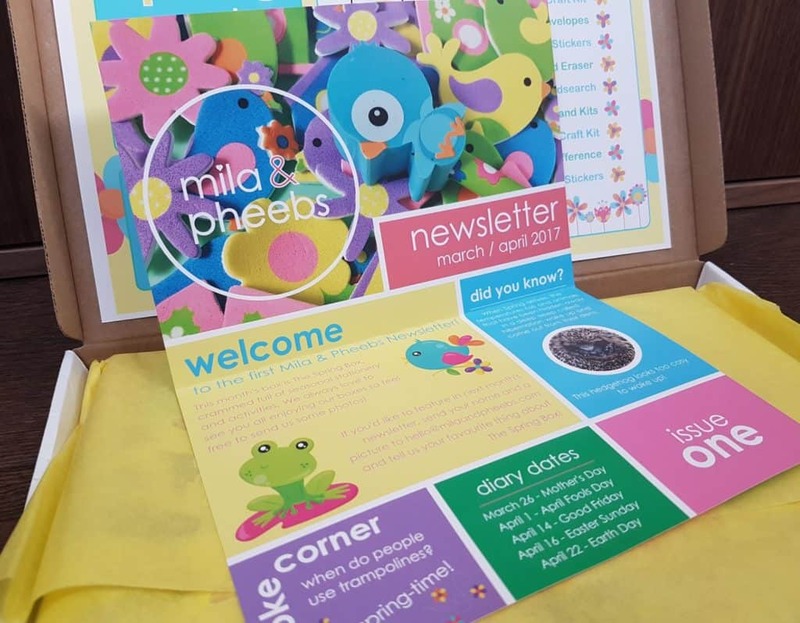 Nicely done Mila & Pheebs!